Career Coach Scott Swedberg '07 created his dream job when he founded The Job Sauce in 2014. Scott and his team of career services professionals are dedicated to helping clients land their dream jobs quickly with meaningful raises. Watch Scott's informational webinar to gain helpful hints on how to land your ideal job!" Dave Lucey ’87, Vice President of Talent Acquisition at Epsilon, offers tips and suggestions on writing an effective resume. Use this PDF resource and sample résumé to write your first resume or to tweak your current resume. We encourage you to share any internship opportunities or job openings by emailing Kristen Bowes in the Alumni Relations office and on the official St. John’s Prep Alumni Network LinkedIn page. Highlighted below are recent internship and job opportunities sponsored by alumni and friends for St. John's alumni and current students. Please note that any jobs or internships listed on this webpage are not guaranteed to be provided to Prep alumni. More internships to come! 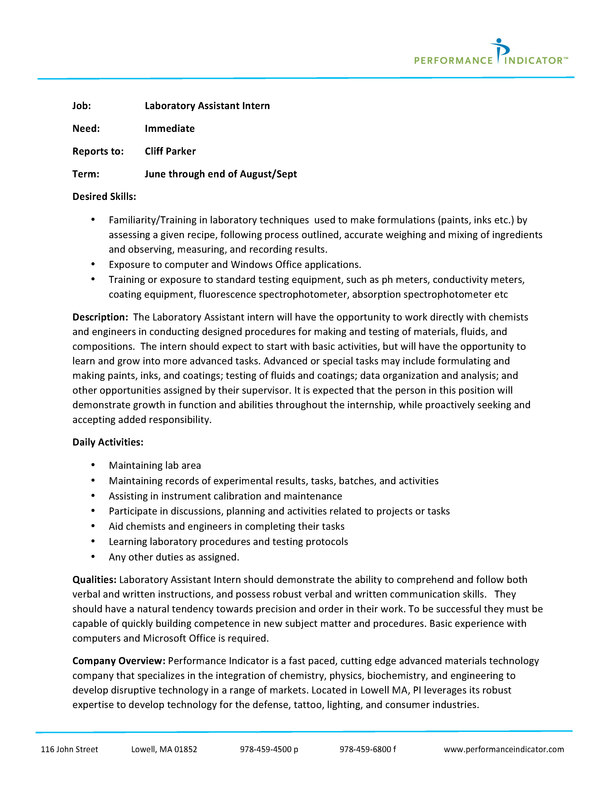 Performance Indicator: Lowell, MA - has an immediate opening for a Laboratory Assistant Intern who will have the opportunity to work directly with chemists and engineers in conducting designed procedures for making and testing materials, fluids, and compositions. Full job description here. If interested please email Nibal Awad. Custom House Maritime Museum: Newburyport, MA - Summer internship for High School students. Any student with a love of history or an interest in museum work is welcome take advantage of this opportunity. This program aims to teach local history and professional skills by having students train alongside experienced guides and museum aides. They will have the opportunity to propose and create a project showcasing their individual skills, such as a museum tour, a presentation, or a small exhibit in the museum. This is a chance to add a valuable experience to their resume and to create a great memory for themselves, their families, friends, and school. Interested students may apply online, or email Bryanne McArdle with questions or to set up an appointment to talk about the program. SAP: Multiple locations - The SAP Academy for Early Talent is presented by Drew LeBlanc '05, Director of Innovation. The program attracts, inspires and develops a globally diverse community of high performing university graduates. It harnesses the skills and natural abilities to empower the next-generation of SAP professionals through a world-class multi-dimensional learning experience. Recruiting for the 2017 classes has started! Apply online. Biased Boston Sports: Are you interested in the journalism/blogging world? Biased Boston Sports has internships available for committed individuals looking to pursue careers in journalism. If interested please visit biasedbostonsports.com or call Peter Packowski '14 at 978-766-3841. Massachusetts House of Representatives - Office of the Minority Leader: Boston, MA - The Republican Leader’s Office (RLO) performs fiscal and policy analysis for the Republican members of the Massachusetts House of Representatives and serves the constituents of districts from where the Republican leaders serve. The Analyst’s primary responsibility is to become an expert in the current policies surrounding a particular set of issue areas for the House Republican Leader, Brad Jones, and the other members of the House Republican Caucus. For a full job description and to apply visit indeed.com. For questions please contact John Prudente '11. Application deadline June 29, 2018. START: University of Maryland, College Park - The National Consortium for the Study of Terrorism and Responses to Terrorism—better known as START—is a university-based research and education center comprised of an international network of scholars committed to the scientific study of the causes and human consequences of terrorism in the United States and around the world. START is currently hiring for the following positions: Business Coordinator, Program Manager, UWT, and Junior Research, PIRUS. For a full job description and to apply, please visit Jobs at START. LEAP for Education: Salem, MA - Director of Development opening. LEAP for Education, Inc., founded in 2002, is a non-profit located in historic Salem, MA. LEAP has a mission to empower low income and first-generation-to college students to perform at higher levels in middle school and high school and to graduate from college prepared to succeed in a career that matches their strengths and passions. The Director of Development will work with the Founder and Executive Director as a senior member of the LEAP for Education staff. She/he will be a key thought leader within the organization and will work closely with a range of internal and external stakeholders such as the Board of Directors, donors and staff colleagues. The Director leads the overall fundraising effort for LEAP for Education. Full job description here. If interested contact Linda Saris. Northwestern Mutual: Stamford, CT - "Career with a Purpose: The Financial Advisor Opportunity". You’ll have the unique opportunity to create your own destiny and potentially have a lifelong impact on the lives of your clients, families, and your community. Northwestern Mutual offers a personalized approach to uncovering financial solutions tailored to each client's individual needs. Full job description here. If interested contact Theresa Raytar, 203-653-2129. Creative Circle: Boston, MA - is looking for a self-motivated and collaborative National Accounts Sales Coordinator with 0-2 years experience. This position will support the Director, National Accounts and Account Management teams working on a defined set of large, multi-market client partnerships. Full job description here. If interested contact Kurt Brown '99. Merrill Lynch Financial Advisor: Andover, MA - An entry-level position with an established Financial Advisory and Wealth Management Team at Merrill Lynch with a career track to becoming a Merrill Lynch Financial Advisor. This job is presented by Larry Hurst P '17, senior vice president wealth management. If interested, please call Larry at 800-734-0650. MarkForged: Cambridge, MA - Are you interested in manufacturing and 3D printing? Multiple job and internship openings presented by Matt Katzman '01. If interested, please email Matt Katzman. Hancock Survey Associates, Inc.: Danvers, MA -Looking for a corporate Accountant for organization's financial operations. Oversee financial functions including accounting, budget, credit, insurance, tax, and treasury. Certified Public Accountant (CPA) preferred. Establishing and maintaining the organization's accounting principles, practices, procedures, and checks and balances. Prepare financial reports and present findings and recommendations to top management. Requires a bachelor's degree and at least 15 years of direct experience. Full job description here. If interested contact Hancock, (978) 777-3050. The annual Young Alumni Career Workshop took place on January 4, 2017. Check out these helpful hints from Coley Rybicki '78! 1. Job descriptions - Companies spend a lot of time writing them - use them to your advantage. Hiring managers are looking for candidates that are prepared and confident in their accomplishments. 2. Be happy - Money isn't everything - at a minimum you will be working 2080 hours a year, your well being will suffer if you are unhappy with your career. 3. Adaptability - Despite four years of college most do not work in the professions they studied as an undergrad. Be open to all possibilities. It is okay to apply for jobs in a variety of industries. 4. Work your network - Start with your St. John’s Prep and college networks; the more connections you have, the more opportunities you might find. Keep your LinkedIn and Prep EverTrue app profiles up to date. Attend events such as SJP Business Breakfasts and regional networking receptions. 5. Know the value of a Prep education - St. John’s Prep is not only well known in the Boston area, but holds a strong reputation around the country. You may feel pressure to remove your high school information from your resume. You never know, your interviewer may have a connection with the Prep! Matt Donato '94, Director, Center for Careers and Life After Brown, Brown University, shares some of the steps he recommends for his Brown grads as they begin a job search. Fully understand your financial conditions: How much do you need to make to pay current expenses and meet long term financial commitments? How much do you need to make to have a reasonably fulfilling lifestyle? Make an inventory of your skills so you know what you're good at (or need to improve on). Also, make an inventory of the qualities you want in a job (big vs. small organization, customer facing vs. desk job, amount of travel, etc.). Write a resume and outline how you will write cover letters for job opportunities. Your resume should be a well-organized, cleanly formatted summary or snapshot of your professional skills, qualities, achievements, and expertise. When you write a cover letter, it should be customized to a specific job opportunity. It should connect the requirements of the position laid out in a job posting with the skills, qualities, achievements, and expertise on your resume. Have more than one person (a friend, relative, networking contact, career counseling professional) review your resume (and occasionally your cover letters) to spot errors or make suggestions for improvement. Network, network, network. I can't emphasize enough how important networking is in today's economy. Networking is relationship building, not transactional. Prepare for networking conversation or informational interviews much as you would for real job interviews. Always be open to networking opportunities. Utilize all networking avenues available to you (your network of family, friends, neighbors, fellow high school or college alumni, former professional or volunteer colleagues). Try to network your way into organizations that interest you or that will be hiring. Set daily, weekly, monthly goals for job search actions you can control: networking calls made, informational interviews requested, resumes submitted, etc. Treat your job search as a full-time job (which also means, taking a break occasionally to avoid being overwhelmed by the search). Consider part-time or temporary employment to help alleviate financial concerns. Also, consider volunteering for a day or two each week. Getting out and doing something, whether paid or not, can provide structure, enhance your feeling of self-worth, and potentially expand your professional network. Be self-aware. Make sure you feel like you are making progress in your job search. Try to know where you need to improve throughout the process (practice interviews, resume writing, etc.). Keep track of what is working and what is not working. Don't be afraid to ask for help. Career Tips - Peter Dolan '74, chairman of a national task force on childhood obesity (ChildObesity 180) and past chairman and CEO of Gemin X Pharmaceuticals and Bristol-Myers Squibb. Use these tips to make your search more effective. Start with an honest and critical assessment of your strengths and weaknesses. Be able to tell your story. Generate a list of 10-15 people you think would be willing to help you on your journey. This is NOT 10-15 people you barely know but instead people who are in your targeted area and whom you can seek advise from. Network with the people on your list. Ask to meet then pick their brain with questions relative to the industry you wish to pursue. Do not burn up your best network prospects until you have done #1. Don't meet with people until you have a story to tell. Make sure you can tell your story in a compelling way to make these contacts want to help you. The purpose of meeting with your 10-15 best network people is to get at least one or two ideas from every meeting; industry pros and cons, people you can call or meet, interview tips, etc. Follow up, follow up, follow up. Demonstrate you are the kind of person they want to help and would hire if they could. Let them know what happened when you called or met with their contacts. Keep them appraised of your search process overall until you land a job. Be open to serendipity and don't miss an opportunity to tell your story. You never know where the conversation may go or where it might lead. Finding a job is hard work. It requires positioning yourself in a positive but realistic way and targeting your search toward appropriate prospects. It also calls for a positive attitude (and a willingness to accept rejection), and above all else, persistence.